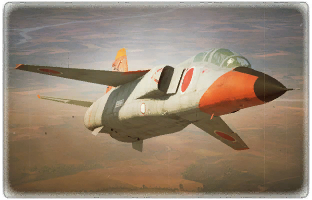 The Mitsubishi T-2 is a rank VI Japanese jet fighter with a battle rating of 10.0 (AB/RB/SB). It was introduced in Update 1.87 "Locked On". 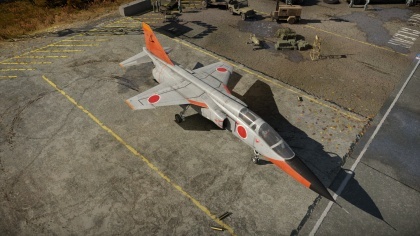 This jet, according to update 1.87, Is the fastest jet. The manoeuvrability isn't a strength. The acceleration is comparable to the MIG-19, it is excellent but may not be the best at very low speeds. It has two AIM-9E for dogfights and some rocket and bomb loads. The 20mm Gatling cannon does take a learning curve to get use to because of a short .25 second spool time. This jet comes with radar assisted aiming. Has a radar and radar gun sight, allowing you to better plan your booms and get your rounds on target more reliably. Maneuverable to get onto target with relative ease.